Family prizes and full skirts are the theme of this season. 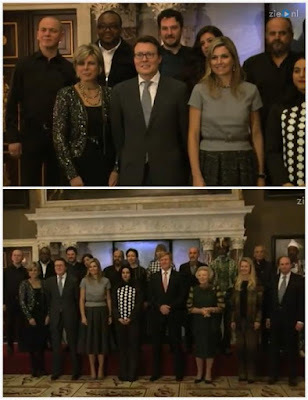 Queen Máxima presented the Prince Bernhard Culture Foundation Prize. The Dutch royal family attended the presentation of the Prince Claus Awards. This (on Máxima, and again a repeat), I quite like. The belt makes the difference, and makes me wish there was one present for that patterned extravaganza up top. See video of the family at the Prince Claus Awards here and here. Click here for a gallery with photos from both events.